"Often left out of discussions about precarious work, workers in the New York State arts & entertainment industry continue to face high rates of contingent and project-based employment, low average income, and inadequate employment protections. State policymakers should consider strengthening economic and legal protections for arts and entertainment workers to ensure the continued growth of this indispensable industry to the state economy." State of the Artist draws from government surveys, industry reports, and interviews with key stakeholders to assess the condition of the New York State arts and entertainment (A&E) industry and its workforce, identifying key issues faced by workers in each sector of the industry. Trends in demographics, employment patterns, and income by A&E occupation are analyzed using comparable data presented in the Cornell University ILR School’s 2009 report, Empire State’s Cultural Capital at Risk? This analysis, including a conference attended by industry leaders and representatives to assess reactions to preliminary findings, served to identify current challenges facing this vital workforce to the state economy. Often left out of discussions about precarious workers, many working within the AE industry continue to face high rates of contingent and project-based employment, low average income, and inadequate employment protections—all of which are explored here. State of the Artist concludes with a summary of public policies currently in place as well as those under consideration, providing an updated set of questions for New York policymakers. For more information about this report, please contact Lois S. Gray at lsg7@cornell.edu or Maria Figueroa at mcf22@cornell.edu. New York State is a world center for the arts and entertainment (A&E) industry and its vast and uniquely diversified workforce is its main competitive advantage. Funded by an appropriation from the New York State legislature, this report examines the strengths and the challenges facing this industry and its workforce in the state, identifying issues that offer a potential role for public and private policy. Arts and entertainment has been and continues to be an engine of growth for New York’s economy. New York is a world leader in the production of arts and entertainment, one of the United States’ strongest growth and export industries. The multiplier effect of A&E on New York’s economy includes not only its impact on supplier and related industries, but also its broader impetus to technological innovation, tourism, jobs, and population. Arts and entertainment sectors continue to increase in size and impact. New York is an international center for live entertainment, a hub of motion picture and television production, and a global leader in the visual arts. Currently New York’s arts and entertainment industry faces a number of critical challenges which threaten its continued growth. Competitive tax incentive programs implemented across the US and other countries, disruptive technological change, and financial sustainability are among the most pressing issues. The 351,000 New York State arts professionals, including performers, designers, artists, and specialized crafts, have distinctive characteristics as compared with other working New Yorkers. The A&E workforce is heavily clustered in New York City, highly educated, and disproportionately young. Diversity in employment is generally lacking throughout the A&E industry but differs by occupation. Minorities are underrepresented in all occupations, a fact recognized by A&E unions, employers, and New York City government who are engaged in a variety of programs to recruit and train underrepresented minorities and women. New York’s highly skilled arts workforce, which is its key competitive advantage in attracting and retaining producers and consumers, may be at risk as a result of unstable employment, irregular income, high cost of living, and lack of a social safety net. Contingent employment is characteristic of this industry where most workers are hired by multiple employers on a project-by-project basis. The median income for this workforce, while higher than that of the overall New York State workforce, is low in relation to educational and skill requirements. There are wide disparities in income, with only 3.4 percent reporting yearly incomes above $200,000, and nearly a third of A&E workers earning $20,000 or less. Many A&E workers lack the legal protections afforded to most New York workers. Nearly one in three A&E workers are self-employed, over three times the rate as the total New York State workforce. Irregular and nonstandard employment deprive many A&E workers of the protections afforded to other workers under labor laws (unemployment insurance, minimum wages, and workers’ compensation) and increases the risk of wage theft and employee misclassification as independent contractors. Many are expected to work without pay, either as interns or as volunteer workers, to acquire professional credentials and recognition. A&E workers, as a result of irregular employment, lack a social safety net. A&E workers, even when covered by union contracts, may not qualify for health and retirement benefits as a result of their intermittent work patterns. Labor unions and other specialized organizations advocate for and provide support for A&E workers. Performing arts workers who belong to unions are covered by negotiated contracts which set minimum terms and conditions of employment. Workers in small organizations and in newer sectors (e.g., reality TV, video game production) are less likely to be covered by these protections and unionization is rare in the visual arts sector. The Freelancers Union provides health care benefits and serves as an advocate. A number of other arts organizations throughout New York State provide individual support. Public policies in place or under consideration aim to attract and retain A&E production in New York State but rarely provide direct aid or services to the workforce. New York State and local governments currently provide support to attract and retain A&E production—notably motion picture and television—through tax credit and exemption programs, as well as direct financial aid. The New York City Freelance Isn’t Free Act—the first of its kind in the country—represents an innovation in policy to protect freelance workers across industries. Continued tracking of statistics for this key industry and investment in more accurate and meaningful data collection. For details on each recommendation, please download the full report (PDF, 7MB). This initiative is possible because of the support of the State of New York. The opinions, findings and/or interpretations of data contained herein are the responsibility of the authors and do not necessarily represent the opinions, interpretations or policy of the State of New York or of the ILR School, Cornell University. 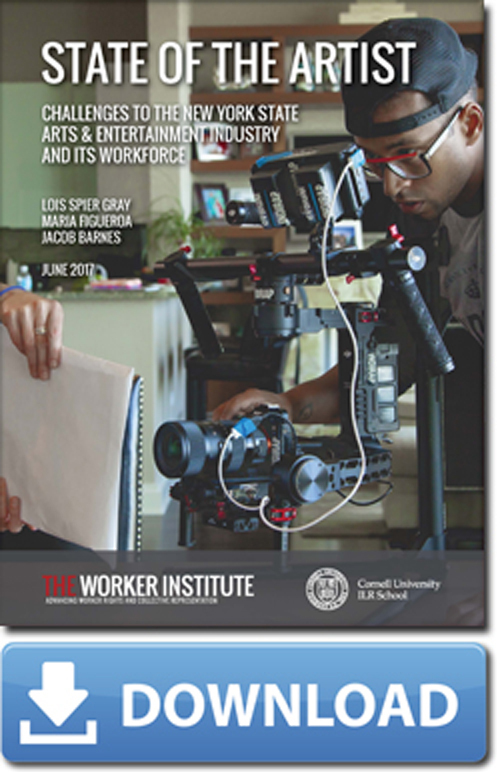 The Worker Institute at Cornell, an institute of the ILR School, engages in research and education on contemporary labor issues, to generate innovative thinking and solutions to problems related to work, economy and society. The institute brings together researchers, educators and students with practitioners in labor, business and policymaking to confront growing economic and social inequalities, in the interests of working people and their families.